To be able to make a profit on business or investment trading, be it forex trading, stocks or binary options, we must use strategies to be able to profit consistently. There are so many kinds of trading strategies that can be used to predict price movements as a point to enter the market or open a trading position. 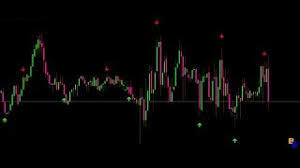 On this occasion I will share technical analysis strategies using indicators. Recently on the trading platform IQ Option has added 4 types of the latest indicators to help traders analyze price movements. One of them is the KDJ indicator. Designed to help traders as effectively as possible and of course this indicator is worthy of your try. The KDJ indicator is effective in determining the optimal trend and entry point, so that it can be used to help determine when the right moment to open a trading position. For those of you who are accustomed to using technical analysis, the KDJ indicator will look familiar and like the Alligator and Stochastick Oscillator indicator combination. This combination is very helpful in determining the direction of the trend or strength and also the optimal entry point. The KDJ indicator is more effectively used in trending price movements and is less effective in flat or sideways price movements. How to use KDJ indicator? Usually for trading binary options with an expiration time of about 1 minute, I use a 15 second candlestick time interval and a 15 minute time frame and 5 minutes to do the analysis. For trading with another period of time, please experiment to adjust to your trading style. 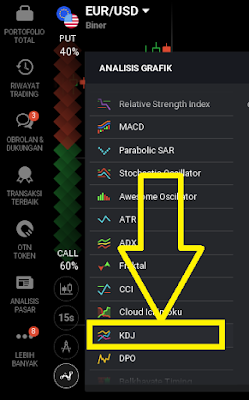 For more optimal analysis results it is recommended to be combined with other indicators such as ADX indicators and ATR indicators. Please note that none of the indicators can provide 100% accurate signals from time to time. Even the best. Therefore, don't forget to follow risk management and capital allocation. Hopefully the trading strategy tutorial using this KDJ indicator is useful for you in achieving profit consistently.